The world has suddenly changed, and Flex Sheridan doesn't like it. In an effort to save his sister from the zombie-like epidemic that has swept over the eastern United States and quite possibly the world, Flex re-connects with perhaps the strongest woman he knows - Gem Cardoza, his former girlfriend. Together they take his six-year-old niece Trina, the only uninfected survivor of his sister's famiy, and his infected sister Jamie, and make a run from central Florida back to his isolated home in Lula, Georgia. On the way they encounter another uninfected, Hemphill "Hemp" Chatsworth. A naturalized U.S. citizen, Hemp is British, and extremely smart. He holds a degree in Epidemiology and Mechanical Engineering, both of which this group will need. Along with the crossbow-wielding Charlene "Charlie" Sanders and a pregnant Great Pyranees dog, this small group uses street smarts, book smarts, and technology to defend against the new "Abnormals" that walk the earth. But Hemp is also compelled to learn how they got this way, and if possible, how to reverse the condition and save Flex's sister. So grab your machine gun and take a ride in their fortified vehicles and mobile lab; you're going to want these people on your side when the Dead Hunger . 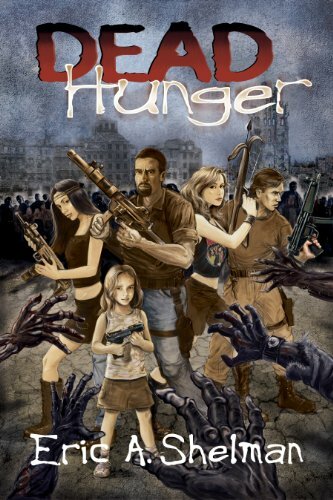 . .
Dead Hunger is an action packed, heat packing, zombie killing, fast paced ride! When Flex goes to check on his sister he walks into a horrific surprise waiting for him. I liked Flex’s character. He does what is right out of love and the simple fact that it’s the right thing to do. The atmosphere that Mr. Shelman creates while Flex is at his sisters house opened up the story to the fact that the whole world was about to change--being overrun with zombies. Mr. Shelman used Flex’s family to make me care right off the bat…I don’t know that I would have felt so much for the situation were it not for Flex’s niece. That really pulled me in. I did however love Hemp! Hemp is a genius scientist and a jack of all trades (Did I mention his accent?). He knows everything about guns and cars…I could use some of Hemp’s inventions when I’m going down I-85. Yes, I know I just sounded a little scary, but he made super cool stuff. I think he is my favorite character and I am really excited for his book. This was a fast read. It was between a 3 and 4 but I don’t do half's. Just a warning in the description when it says strong language, it’s not joking and there is a lot of it. But, I enjoyed Dead Hunger. Adults: For graphic violence and strong language. * When I checked last night the Kindle version of Dead Hunger was free!!! I have Amazon Prime, so I don't know if that changes things. Thanks so much for sharing this! From what you've said, I think you're right, that Gem is indeed thrown in without making it belieable... and I think that mobile lab thing might make some eyebrows arch. Still, just like with Hollowmen, I think that this is a "comfort read" of sorts, and if it achieves its purpose of cool unstopping action, with some clever wit thrown in for good measure... Then I want to cehck this one out!